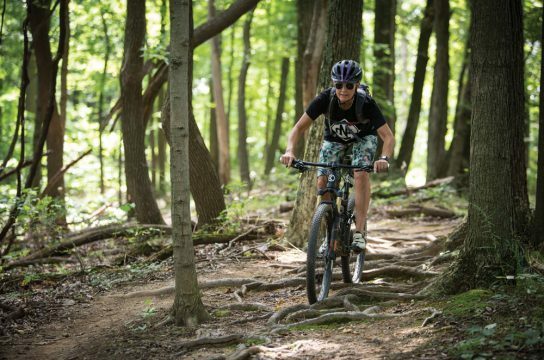 After publishing an article titled 10 of the Best Mountain Bike Descents in the Midwestern USA, some of our Indiana readers took issue with the inclusion of Brown County State Park’s Hesitation Point Trail. With almost 400 feet of descending on flowy, smooth-rolling dirt punctuated with the odd technical feature or two, on paper it looks like a sure winner. 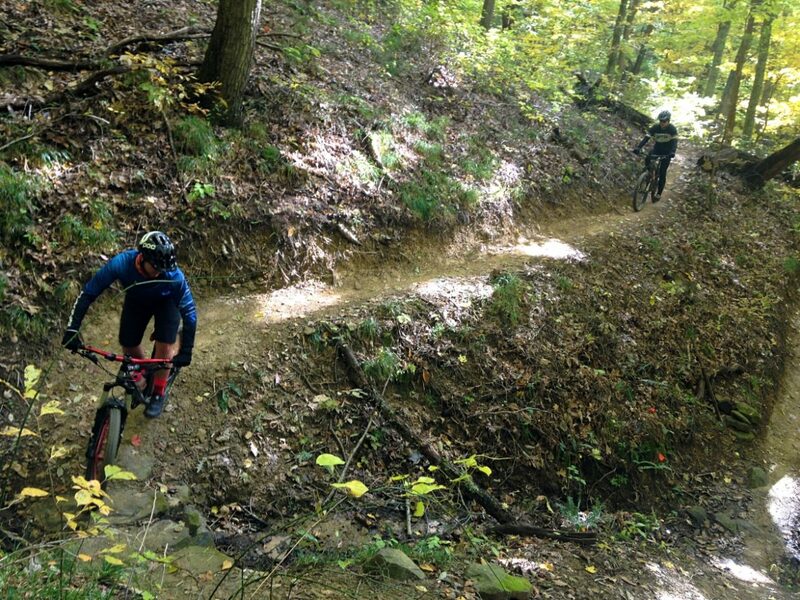 However, many mountain bikers prefer an even rowdier descent located not only in the same park but on the same slope: Hobbs Hollow. In researching my original list, I passed up on Hobbs due to the 170-foot climb interrupting the 550-foot descent. To me, those numbers seem to be pushing the limits of descending in a region already pushing it on extended descents. Singletracks’ Hoosiers begged to differ. If anything, this omission shed light on the reality that as of 2019, mountain bikers outside the Lower Midwest have a severely outdated perspective of Brown County. Luckily, Paul Arlinghaus of the Hoosier Mountain Bike Association (HMBA) is willing to help update that image. Immediately following the article’s release, he asked if I would come down to see what the club has been up to for the past few years. It took some proactive scheduling, but over Halloween weekend of 2018 I finally made it to Brown County. Over two days Paul and a few other dedicated Hoosiers guided me through some of the best singletrack Brown County State Park and its surroundings have to offer. I’m still not completely sure how they did it, but HMBA has practically performed a miracle; deep among the sprawling cornfields of the Lower Midwest, they have created a true backcountry experience. In addition, this feat was pulled off while keeping trail quality, variety, and mileage high. 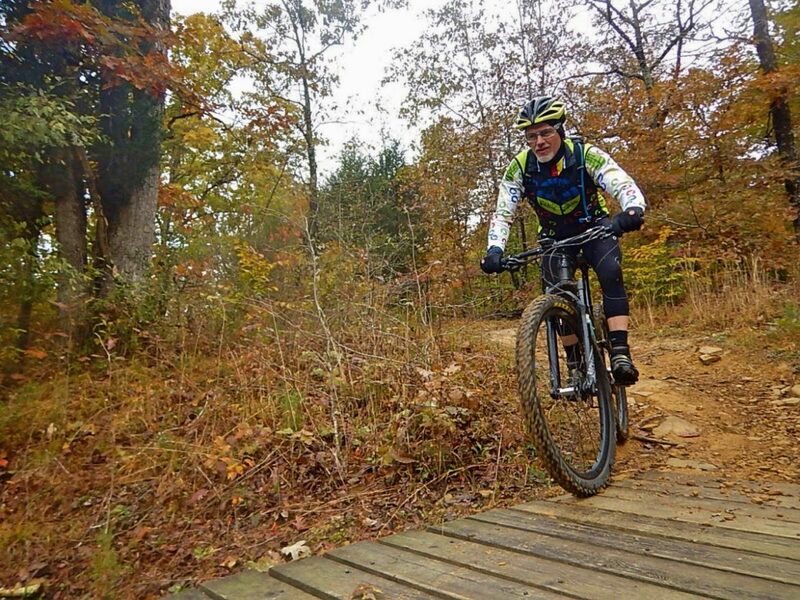 Essentially, HMBA has managed to create one of the first true mountain bike destinations in the Lower Midwest. Don’t take that to mean that good singletrack doesn’t exist in the Midwest. It’s just that no other locale has managed to attain high trail variety, quality, mileage, and scenery in such a small area. And although Brown County is still pretty small, it’s more than large enough. 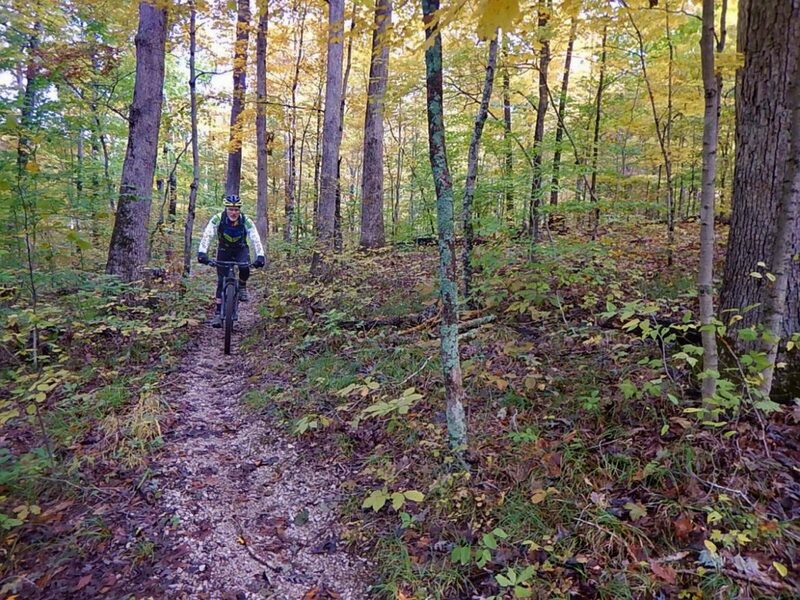 It should come as no surprise that Brown County State Park has great riding. This is largely due to the park being centered around the decently large Weed Patch Hill and its associated ridges, which allow trails to have the sustained descents mountain bikers love and the sustained climbs we accept as retribution. A dedicated group of individuals at HMBA has sacrificed countless hours to work on the trails and make this place a reality. They created the trails, they maintain them, and they will certainly build more. Brown County simply could not exist without them. Here are a few of their best masterpieces. 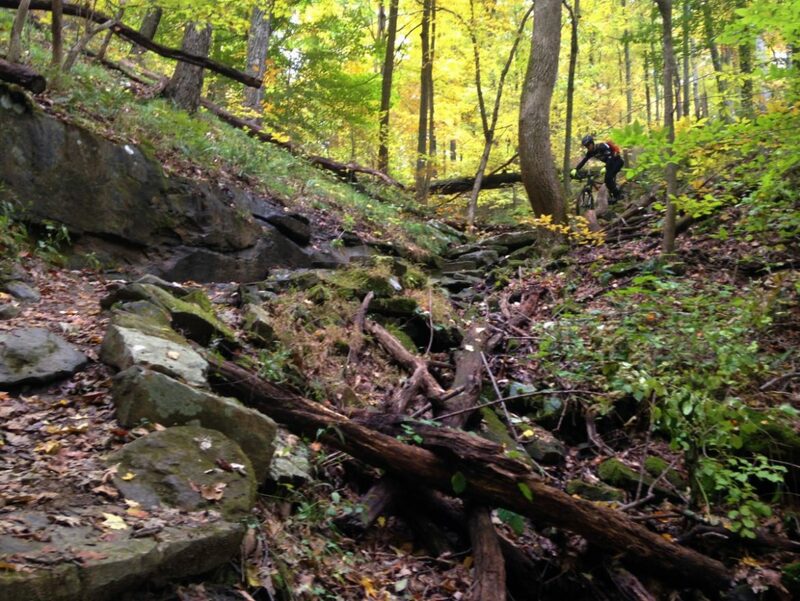 Hobbs Hollow could be compared to any bike park’s flow trails and at least put up a fight. Now that I’ve ridden it, I’m shocked that I wasn’t able to see its potential when researching the best descents in the Midwest. The newest addition to the system, Hobbs treats riders to a delightful balance of rollers, tabletops, and berms. Furthermore, skill hardly matters on this trail. Beginners just roll over the features while more advanced riders can rail berms, boost jumps, and send alternate lines. As for the climb in the middle, this trail mysteriously seems to “eliminate” climbing. Riders just need to shift into a lower gear and soak in the scenery. Aynes is a classic climb-descent loop like the ones you might find in Pisgah or in the West, but on a smaller scale. Going clockwise, riders slowly wind up a smooth, easy climb punctuated by the occasional steep section. Nearer to the top, technical elements become more and more common as the grade increases until riders crest the ridge line. From there, drop your seatpost, open your suspension, and get ready to rail a wild descent. Bobcat Loop, a quick option off of Aynes Loop, is no cakewalk. Although many sections are challenging, the main difficulty with this trail is that the otherwise rideable features are spiced up with off-camber sections of narrow trail skirting sizable drop-offs into the gullies below. Once you’re out of those few spots, fairly technical trail, beautiful forest, creek crossings, and log hops await. This trail is so difficult it even made a worthy entry on Jeff Lenosky’s Trail Boss series. While “riding” this endless carpet of rock step ups, very slick rock sections, massive log hops, and grueling rock (or in this case boulder) gardens, Jeff Seelig, one of the trail designers and builders at Brown County State Park, and Paul, showed me how to really do it. Despite riding the trail for years, the most difficult features on the trail still stumped them at least three times. However, that difficulty is what makes this trail so alluring. If your attempt doesn’t pan out, take the time during your hike to imagine how anybody could even ride something like that. The sheer amount of backcountry singletrack accessible from the park floored me during my trip. By using a small doubletrack horse trail that starts in the Taylor Ridge Campground, dozens of miles of steep trails in Yellowwood State Forest and Hoosier National Forest become available. The hardest part isn’t finding the backcountry trails; it’s choosing which one to ride, and that’s certainly never a bad thing. Hopefully this short list will at least narrow the field. Winding above a secluded forest lake and just below the ridge top, the relatively new Crooked Creek Loop offers some of the best variety of any trail in the area. When riders aren’t log-hopping or navigating slippery roots and rocks on steep climbs and descents, they’ll be flying along flowy, hand-built singletrack among mossy rocks and encroaching trees. The trail itself is even a stunner; HMBA clearly did a great job armoring and grading appropriately so the tread will be preserved for years to come. In addition, during the leaf season, the brilliantly-colored leaves around the lake are on full display as you cross the lake’s earthen dam. Nebo Ridge is the classic backcountry ride in the area for good reason. For starters, the trail follows the spine of its namesake precisely. Up there, any sign of civilization down below disappears and sights, sounds, and smells of the pristine, untouched forest and hills take hold. There isn’t even a road in sight. Next, the raw aspect of this National Forest trail ensures any ride will be rowdy. After all, these trails weren’t built to specific standards, so expect a twisty, steep, and technical ride. The fast and fun nature of Trail 4d easily made it my favorite trail of the trip. Not only does the trail retain some of the sense of isolation that Nebo Ridge has, but it manages to descend over 400 nearly continuous feet via some of the most grin-inducing singletrack I’ve ever ridden. Because the trail descends gradually along a very straight ridge, riders only need get in a few good pedal strokes before pumping their way to the bottom. Add in a surprisingly tacky layer of fine gravel, and any turns that might otherwise threaten your speed can be railed. Finally, the cherry on top is a set of steep (and exhilarating) switchbacks to a road below. Don’t let the fact that this route is technically a run down county road keep you from riding. At this point, the dirt road has faded into something more akin to a narrow doubletrack romp over logs, through creeks, down steep hillsides, and over embankments. And in Combs‘ case, the slightly wider trail gives riders more room to air out even the smallest bumps. After a big ride, there is no better place to go than the definitive hub of mountain biking in Nashville. Feel free to hang out with fellow riders, enjoy the downstairs (or upstairs) bar and tasting room, or close that calorie deficit with some of their fine pizza pies. Hobnob Corner Restaurant proves to be a great place to eat with the family before hitting the trails. 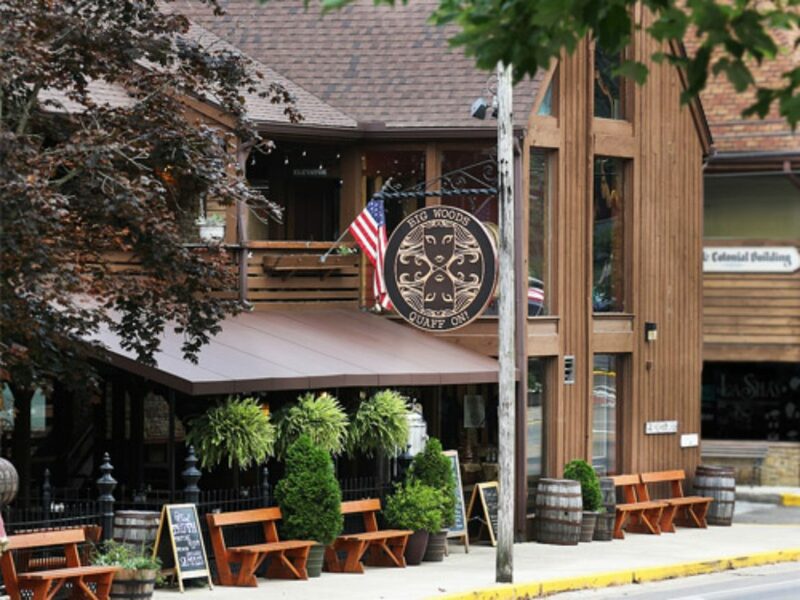 Their good portions, hearty cuisine, and friendly staff will fuel you up for your next big ride. To be honest, you can find any level of accommodation within the park and the adjacent public land. At the top level of accommodation lies the park’s Abe Martin Lodge and its cabins. 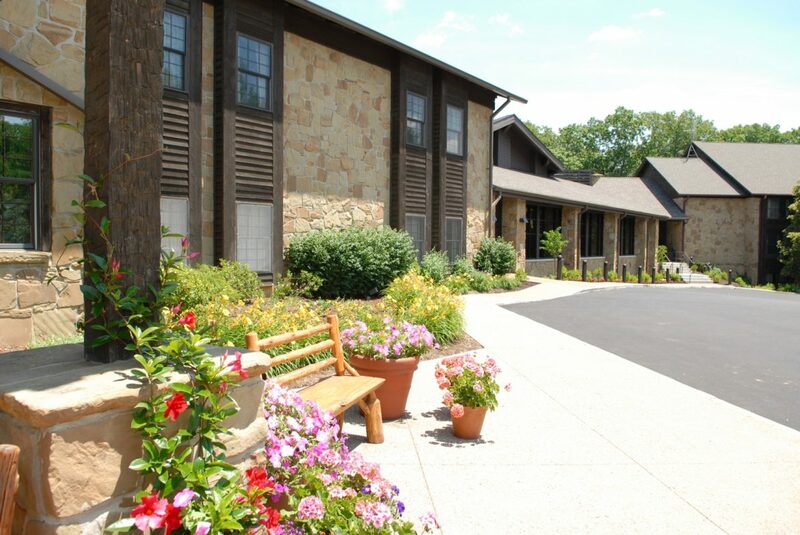 But soft beds and a pool aren’t the only draws; the lodge is situated conveniently next to a system of hiking trails, just uphill from a corral, and not too far away from the main mountain bike trailhead. Brown County also has quite a few campgrounds accommodating a variety of group sizes. Taylor Ridge, Raccoon Ridge, and Buffalo Ridge provide well built electric and non-electric campsites for a more traditional experience. To keep the kids happy, playgrounds are centrally located at most campgrounds. The park even has massive group sites capable of sleeping 50 people if you happen to be part of a mountain biking caravan. If an established campground sounds like too much or you need an ultra-cheap getaway, dispersed camping in the nearby Hoosier National Forest serves as a pretty popular option. Can an outdoor-lover immerse themselves in nature and seclusion in any better way? Honestly, the number of people setting up campers or RV’s just a little ways off the road amazed me. Just remember: try to pick an “established” site and stay within 125 feet of the nearest road. Q’s Bikes might be the only bike shop in town, but it is certainly up to the task. This fat bike focused LBS will supply the best service, most comprehensive tours, and robust rentals, always with unparalleled customer service. 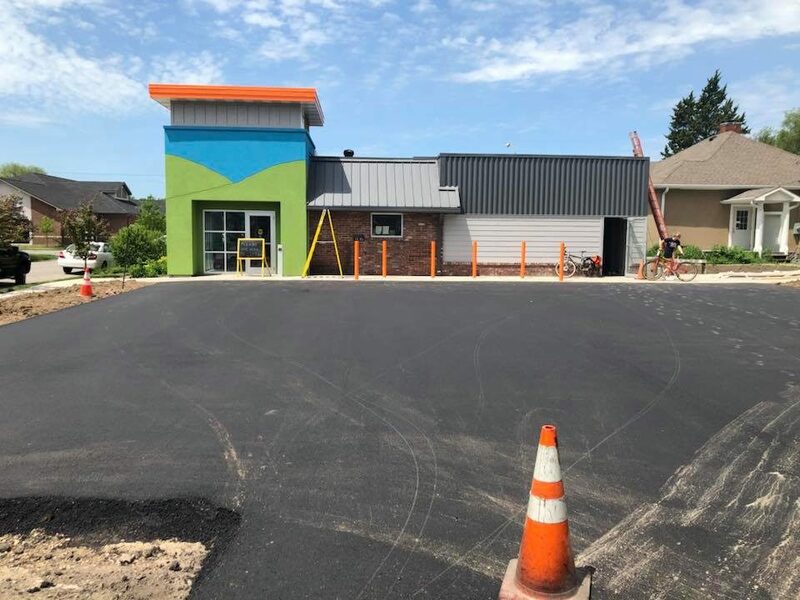 If you’re only looking for a few supplies or want to make a repair yourself, the newly renovated Bicycle Station in nearby Columbus has you covered. Besides good service, they have many of the parts, clothing, nutrition, and bikes a rider could possibly need to reclaim a derailed trip. Your Turn: Are there any classic rides in the “Little Smokies” we missed? Comment down below!